“Will the mobile phone ultimately break?” asks Pranay to a bunch of youngster, while inviting them to drop a brand new Redmi handset on a rough surface. In a YouTube video, uploaded on Tuesday, the Mi fan further explains how the upcoming Redmi Note 7 device is not only scratch proof and sturdy but also comes with an all-new design. This widespread Xiaomi fans’ community is the brand’s social media warriors that played a crucial role in its rise to the top in 2018. The Mi Community – as the company likes to call it – is a group of Mi Fans that does much more than uploading and circulating a few promotional videos on social media platforms. Spread across the country, they are one of the most crucial assets that the company banks on. From spreading updates about the brand and upcoming devices to creating personalised world-of-mouth goodwill for Xiaomi – these fans have swelled parallelly with Xiaomi’s fortunes in the country. From around 10,000 fans in the mid-2014s, when Xiaomi launched its first device in India, it touched close to 3 million fans by the end of 2018. Meanwhile, Xiaomi has turned into a giant. 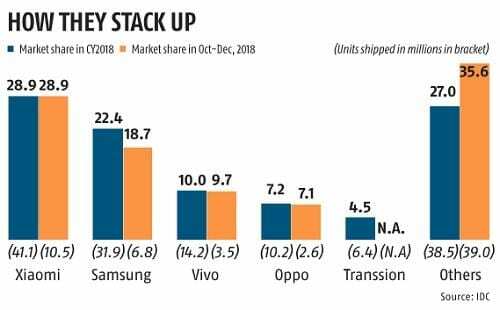 By capturing close to 29 per cent of the 142 million units smartphone market in the country in 2018 – it has replaced Samsung at the top after six years. And, its revenue grew 22-fold to over Rs 23,000 crore in 2017-18 from Rs 1,046 crore in 2015-16. If it’s the Mi Fans that immensely helped Xiaomi’s brand image, it is the firm’s distribution strategy, adopted lately, that has further aided its growth in recent quarters. According to analysts, it solidified its position at the top of the charts in 2018. From an online-only brand till early 2017, Xiaomi today boasts of significant presence in the offline retail space. According to IDC, it now stands second only to Samsung, replacing Vivo, in the offline retail space — thanks to a successful retail partnership programme launched over a year ago. As its business began to grow and Xiaomi captured the top spot for the first time in September 2017 quarter, the firm further focused on its ‘preferred partner’ programme that allows tie-ups with individual retail stores. The Preferred Partner Outlets bear Xiaomi branding and are supposed to push its products. From metropolises like Delhi-NCR and Bangalore to smaller towns with populations of less than 1,00,000 – the partner stores are a key driver of its sales today. “Strong product portfolio and aggressive channel strategy helped it gain market share. Additionally, in 2018, it has expanded its offline reach with an increased focus on its Mi preferred partners,” analysts from Counterpoint Research noted. 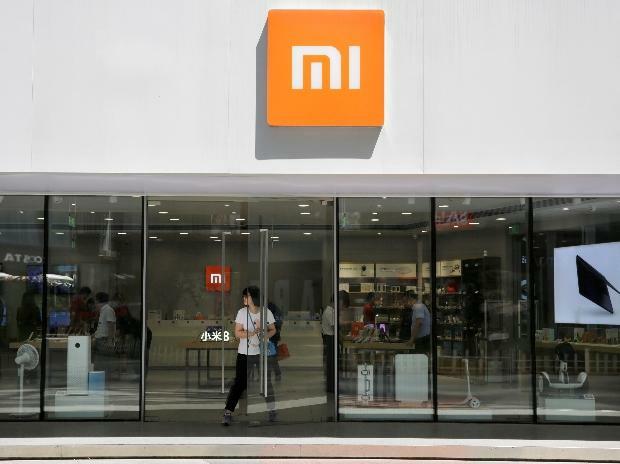 To keep the momentum intact, Xiaomi took Nidhant Chaudhury – a channel distribution professional who has worked in Lava, Airtel and Coca-Cola – on its board as head for distribution in the late 2017. It appointed regional managers to further bolster growth. Consequently, revenue from the offline channel has grown to over 20 per cent of its total sales by end-2018 from less than 5 per cent a year ago. And its shipment touched a record 41.1 million smartphone units in 2018 – more than any brand in the country. Long-standing market leader in the e-commerce channel, Xiaomi extended its lead in 2018 by capturing 47.2 per cent of the online smartphone sales. Since Xiaomi grabbed the crown from Samsung in September 2017, the firm’s grip over the market has only tightened, despite the latter flooding the market with new launches. The 10.5 million devices shipped by Xiaomi in October-December 2018 remained higher than the total 10.3 million smartphones shipped by Samsung and Vivo, the second and third largest players, together. Analysts say Xiaomi’s small yet focused portfolio has also helped it gain share. During 2018, its budget phones like Redmi 5A and Redmi Note 5 (and Pro) emerged as the fastest selling devices across brands, driving 10 million shipments each.